To get started with Aiven Redis, first click the "Create a new service" button. 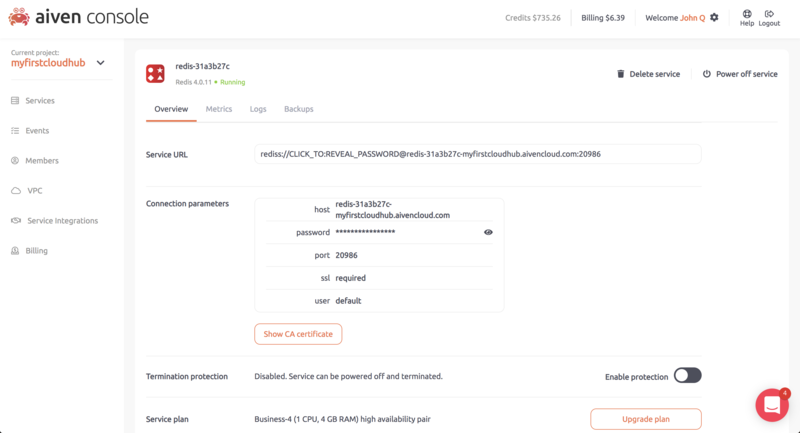 Do note that by default Aiven Redis uses SSL encryption for connections, most Redis clients should work just fine with SSL but if you have a Redis client library which does not support turning off SSL you can consult this support article on how to do that. Redis backups are taken every twelve hours and are encrypted and stored securely in object storage. This example uses the C# StackExchange.Redis library. Code to connect to Redis server using TLS. Uses the following redis client library. The example shows the dependency you can include in the maven pom.xml file. This example uses the Python redis library. uri = "copypaste the url from the console here"